I love the color contrast in this bright 20 x 63" scarf. The background is fairly equal in its use of light grey, black and darker shades of grey. The punch of color comes from multiple shades of purple in a bold flower pattern. This corded necklace is made using both satinique and waxed cording. The length can vary from about 16 to 19 inches with a center jeweled piece that adds just over 2 inches. 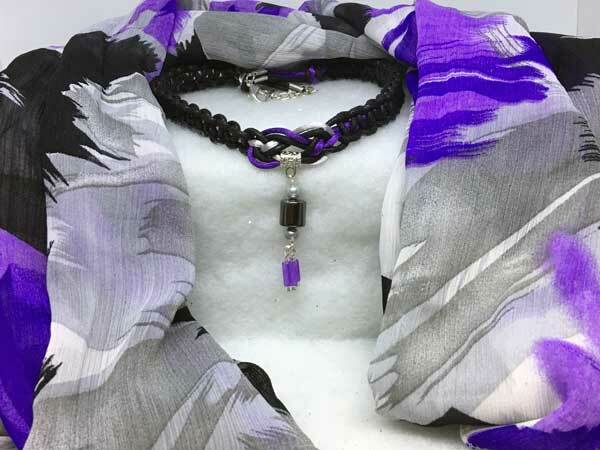 It is done in a silvery grey, black and the same shades of purple as are in the scarf. The jeweled piece starts with a barrel-shaped hematite bead surrounded by two grey pearl rounds. Hanging from that are 3 purple glass tubes with silver seeds on either side that hang individually for more movement, sparkle and fun. The piece is finished with a lobster claw clasp and added chain for more versatility with the length.